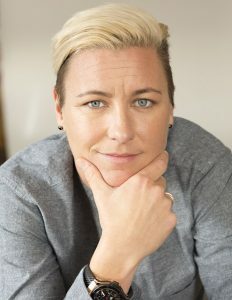 The Women’s Fund of The Greater Cincinnati Foundation will present soccer legend Abby Wambach in its “A Conversation With…” series. A fan favorite known for clutch goal scoring, Wambach now advocates for pay equality. Never wanting to be known as “just a soccer player,” she will be interviewed by Emmy-award winning sports reporter Betsey M. Ross. They will discuss the real costs of pay inequalities and the ways people can partner with The Women’s Fund to understand more. Wambach is a two-time Olympic gold medalist, co-captain of the 2015 FIFA World Cup title U.S. Team, 2012 FIFA Women’s World Player of the Year and an ESPN analyst and contributor. As her athletic accolades grew, Wambach became a leading voice for women’s sports, as well as for her generation of female soccer players and athletes. In 2015, she was named to Time Magazine’s 100 Most Influential People list. In 2016, she received the 2016 ESPY Icon Award. Preceding this event, Wambach will appear at a kids’ soccer expo at the University of Cincinnati’s Athletics Campus from 10:30 a.m. to 12:30 p.m.
Tickets for “Conversation With . . .” are $50 ($40 for students).